Who else is excited? School is starting in a lot of places (and already has in others) but here in Ontario we have until September 4th then we head back! I have been having a lot of fun taking the kids to pick out back-to-school clothes, and supplies. 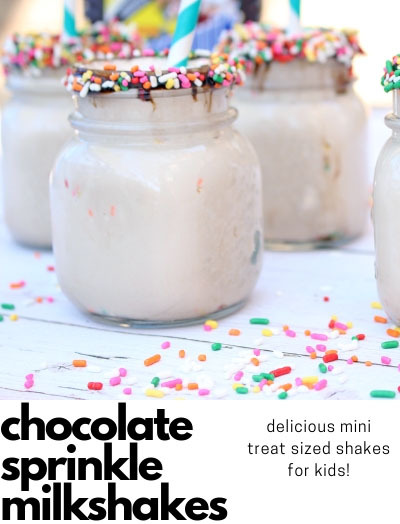 I’ve even gotten a few ideas for teacher gifts to hopefully make to send in with the little kids. 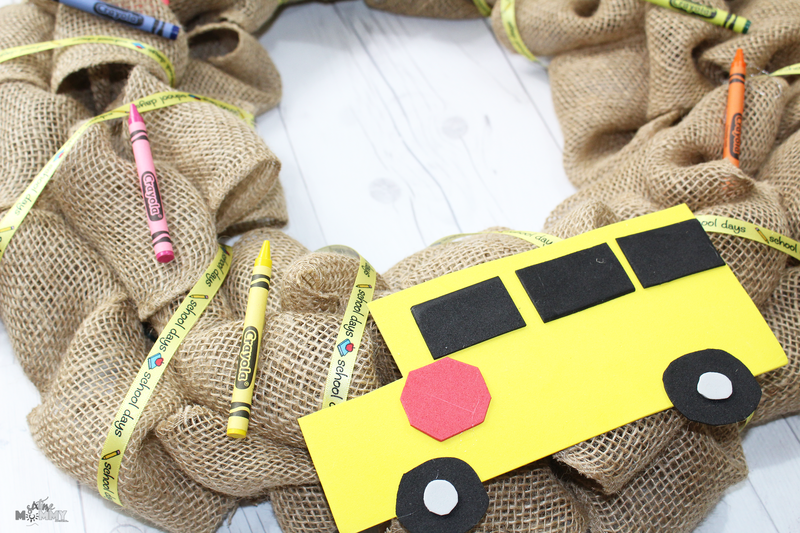 Something fun though for everyone is this super cute school days burlap wreath. Lately, I’ve been all about wreaths. 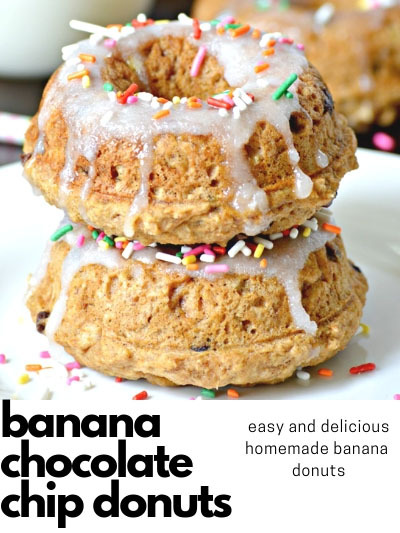 Homemade ones especially. I love being able to make new ones for different seasons and occasions, and the kids think its so fun to have the decorations changed often. How adorable is this bus? School Days are coming, it’s time to celebrate the routines, the dreaded lunch making, the drama and hopefully a lot less of it this year! Want to make a wreath of your very own? It would also make a perfect gift for teachers too, how cute would this look hanging on a classroom door? 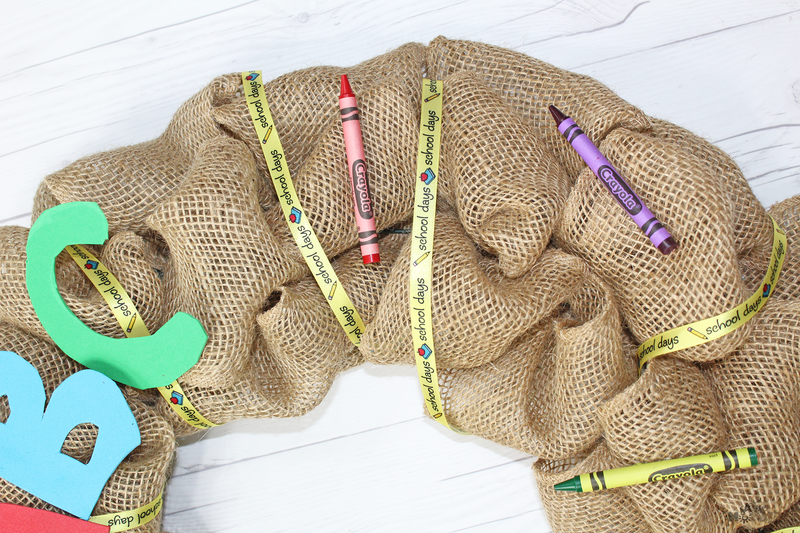 First you will get your burlap ready to weave through the wire wreath. You will need to flip the wreath over and fold the burlap in half lengthwise. Tie a piece of ribbon around the end of the burlap and knot it. Tie this to your wire wreath on the back side. Flip your wreath over to the front side. You will then keep burlap folded and through each three wire parts you will stick burlap through. One folded ribbon of burlap on top of one another so you have three in a row. Depending on how big your wreath is you will do the same right beside it. A large wreath such as this will have two rows of burlap side by side in each section. Once the wreath is completely full of the burlap you will tie off the end and knot it. Then tie to the wreath just like the beginning. 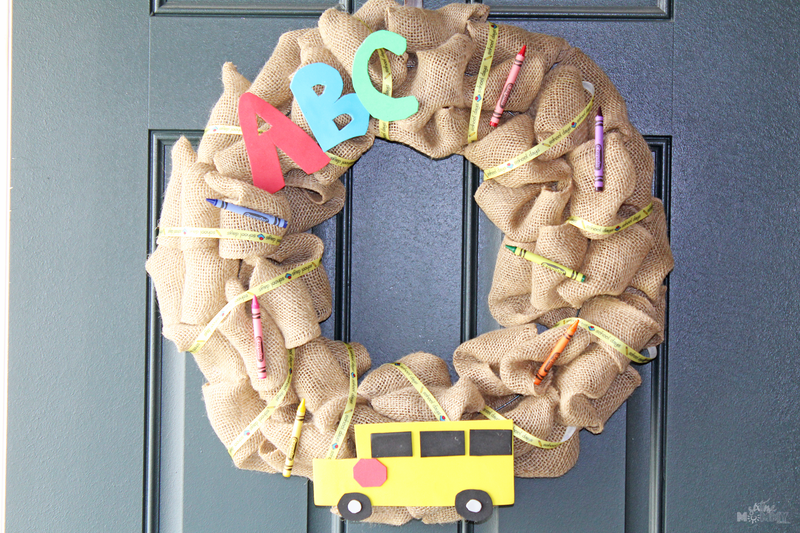 After you are done you want to fluff out your burlap ribbons to give the wreath a nice full look. 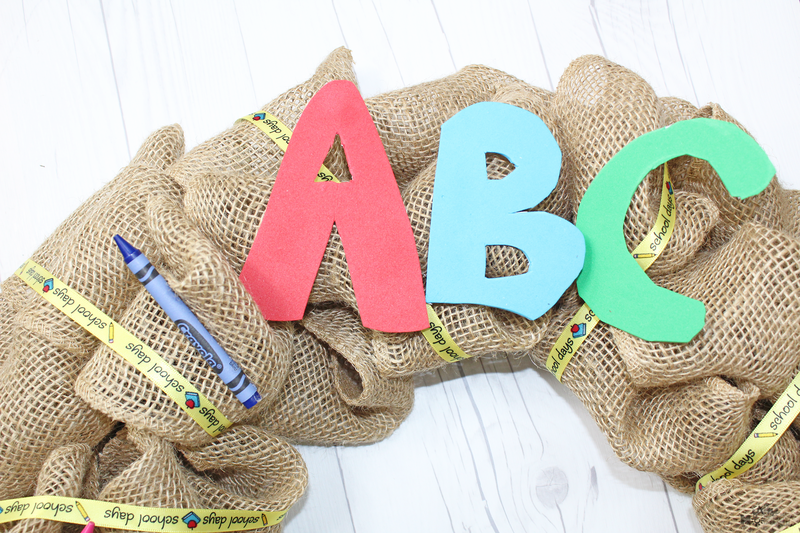 Next I cut my letters A, B, C out of my foam to hot glue onto the burlap. I think made a cute bus out of my foam! It is super easy to do if you look at the picture you can easily follow along. I cut my bus out into basically a rectangular shape with the “front of the bus” cut out. Then two black circles for the wheels filled with a grey circle for each one. You then can draw an octagon shape behind the foam to make it easier to cut out and then stick it to the bus. The windows of the bus are black rectangles and I then peeled the back off the foam and stuck them on as well. 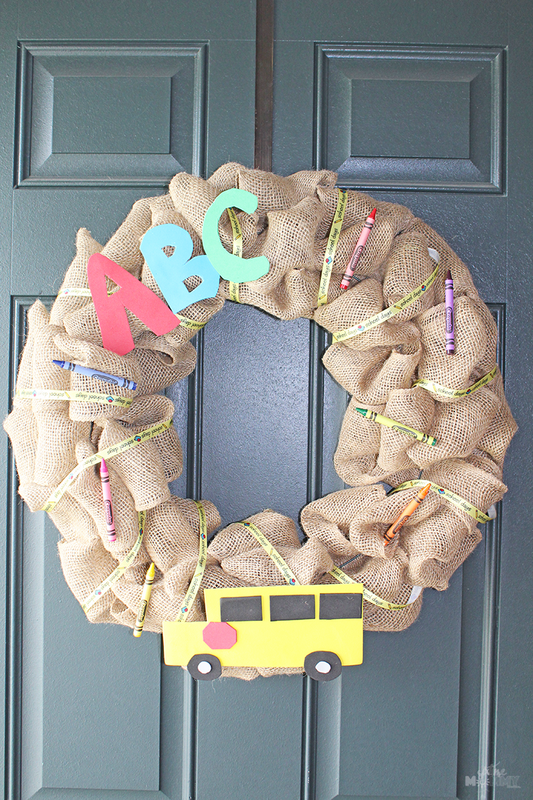 Once you are done with the bus you can glue it to your burlap.Next I wrapped my school themed ribbon around my wreath to add a nice pop and some color! Then you can hot glue your crayons on and then you are DONE!! Look how adorable it looks hanging on a front door! I think it turned out oh so cute. 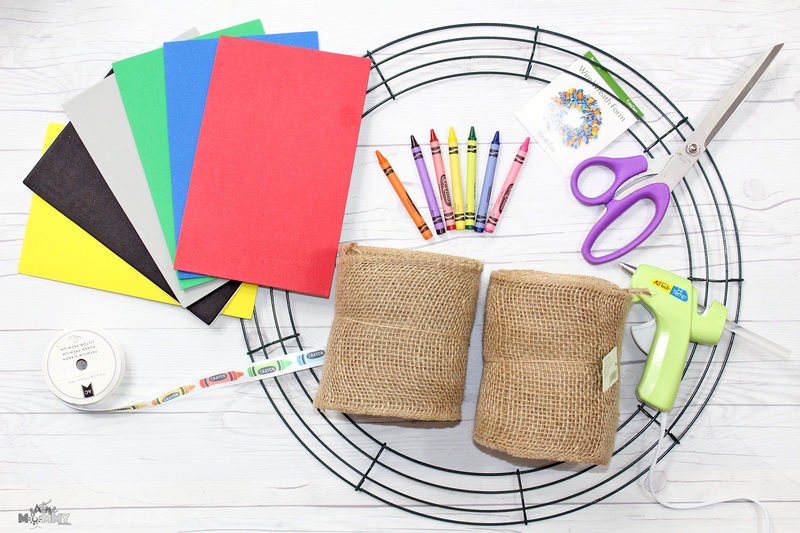 It’s perfect and actually can help your kiddos get back-to-school excited! Justin, thinks this is just the best and has asked me to make him his very own wreath (superhero of course!) he can’t stop looking at these pics, and awing over the crayons all over it! How cute is this wreath? 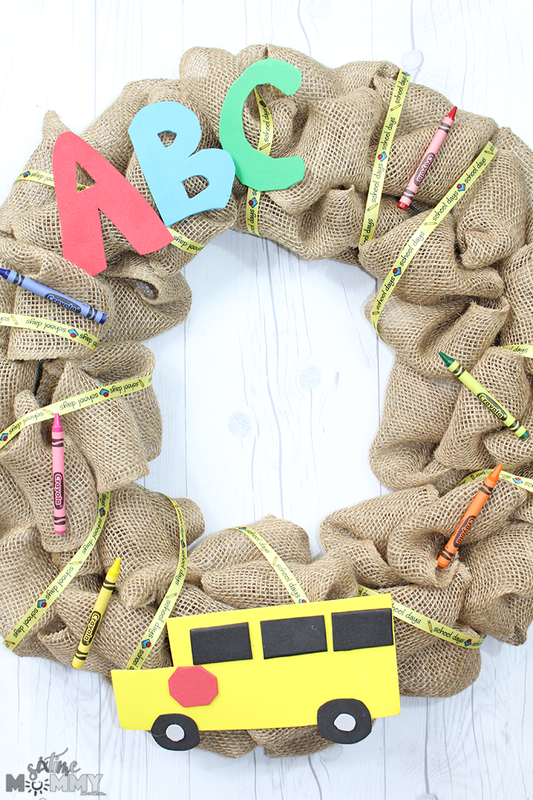 School is almost in session so let’s hang this beautiful wreath on our front door!